During a recent visit to Harding Beach, I photographed Stage Harbor Light during a snow storm. The dark storm clouds behind the lighthouse provided a moody backdrop. The snow flakes added a bit of excitement. Sparse color coming from the trees, grasses and red trim on the lighthouse make the image. This is a classic New England winter scene. Trudging a mile each way in the storm to make this image was exhilarating! 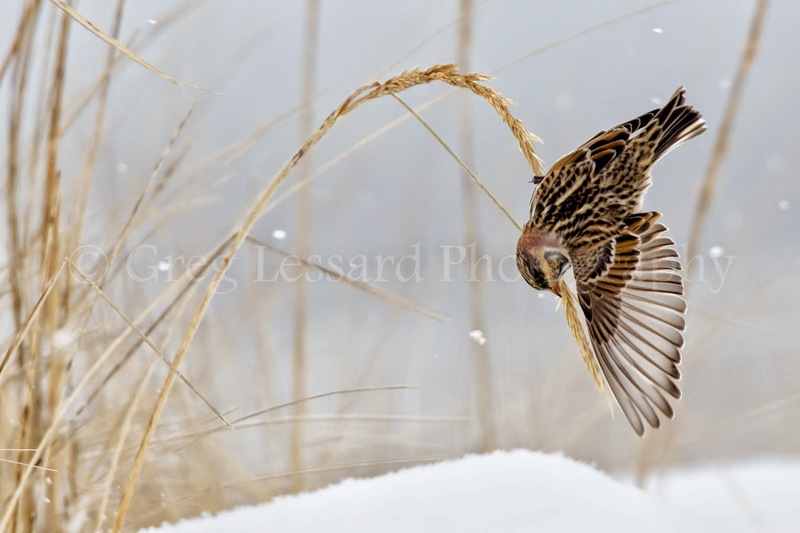 On a recent trip to Cape Cod, I was fortunate to find some lapland longspurs. They were feeding on beach grasses. All of them were female. One in particular was balancing upside down as she made her way down a stalk of grass. This winter has been terribly cold. With a deep snow pack, wildlife of all shapes and sizes are struggling to find food. I was glad to watch these birds find a feast! In New England, the word snow, usually light, fluffy and harmless, has reached a whole new definition. When it is uttered, every man, woman and child acquainted with a shovel, feels a dull ache in the lower back, thighs and biceps. The plowmen simply give a vacant thousand yard stare. Like the landscape, their spirits are buried under winter’s barrage. During this assault from “Old Man Winter”, it would be easy to forget about photography until spring. With the transformation of the landscape comes an opportunity to rejuvenate all things artistic. Seeing the land in new ways and finding new sources of inspiration from old haunts is one of the great blessings of winter. This is not an easy task. Simply dressing appropriately, will take close to a half hour. Once our armor of snow pants, boots, gaiters, hand warmers and multiple layers of gloves are donned, we need to explore by car, skis or snow shoes. This effort is almost always rewarded. Setting out with a plan is important. Have specific goals and locations in mind. These opportunities often work best with forethought in regards to subject, lighting, and weather conditions. When preparation does not play out as expected, be flexible. On my latest adventure, I went to a remote beach on the Cape. I spend more time on the beach in the winter than I ever would in the summer. I love the beach, but I treasure solace and parking, which is rare in the warmer months. The desolate and bleak landscapes of winter provide the peace and quiet that I seek. The tranquil sound of the waves breaking upon the land still my soul. On this day, I had a plan and a back-up plan in mind. While the back-up plan actually came to fruition, the best image of the day came as a result of being flexible. Walking through the dunes, I noticed a song bird that I had not seen up close before. It was knocking seeds off of tall beach grasses. The bird was so hungry that ignored me as I approached. Easing myself into the snow pack, I readied my camera equipment and made some beautiful images of a male snow bunting. The snow bunting is a beautiful bird in its own right, but on this day, the form of the grasses made the image. The hardest part was keeping up with the small bird as it flitted from stalk to stalk. It would frequently face away from the camera and it would often be hidden behind clumps of grass. Moments later it would fly into clear view and rest on top of a stalk of grass for just a moment. The experience of observing this arctic bird made my day. Tip of the Month: Be Flexible. When well thought out plans don’t come together, look for another opportunity. This beautiful world is limitless.